The truth about Orthodox Jewry and what happened in the DP Camps in the American Zone. It shows why and how the Jewish community falls apart in a crisis. 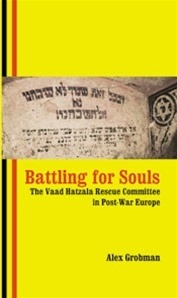 Battling for Souls: The Vaad Hatzala Rescue Committee in Post War Germany by Dr. Alex Grobman is an unusually revealing book about how the Jewish community works. What he finds is not pretty, but he doesnâ€™t judge. And because his book is not a polemic, it has been endorsed by his main subjectsâ€”two major international Jewish organizations who have been at each otherâ€™s throats for decades. That is because, until now, no one has really examined the post-Holocaust period in Europe and looked at how Jewish organizations interact (or donâ€™t!) in time of crisis. Grobman does so, by describing the situation through the eyes of a man with a single agenda--to bring Judaism back to the Jews devastated by the war. The manâ€™s name was Rabbi Nathan Baruch, and he was there, in Germany, trying to make it all â€œcome together.â€� This is a behind the scenes story of what happened in the DP camps of Europe. Every Jewish organization was essentially interested in rehabilitating the survivors in their own image. The battle for their souls was on. The Vaad was instrumental in recreating an observant Jewish community in the Diaspora, and did whatever it deemed necessary to meet those goals. Battling for Souls is a case history of how the Jewish community reacts to itself in times of crises. And while many survivors went on to lead wonderful lives, this book is a sad story that todayâ€™s Jewish leaders, the professionals and the laypeople, need to read. That isnâ€™t going to happen anytime soon, unless people who read this book tell them to read it, too. Alex Grobman has an MA and Ph.D. in Contemporary Jewish History from The Hebrew University of Jersualem. He was director of the Simon Wiesenthal Center and co-author of Denying History: Who Says The Holocaust Never Happened and Why Do They Say It?. Dr. Grobman's resume: Dr. Alex Grobman is an historian with an MA and Ph.D. in contemporary Jewish history from the Hebrew University in Jerusalem. He is president of the Institute for Contemporary Jewish Institute and the Brenn Institute, think tanks dealing with historical and contemporary issues affecting the Jewish community. He is a member of the academic board of the David S. Wyman Institute for Holocaust Studies, a book reviewer for Lifestyles magazine and contributing editor for Together magazine. Dr. Grobman established the first Holocaust center in the US under the auspices of a Jewish Federation in St. Louis, Missouri and served as its first director. He also served as director of the Simon Wiesenthal Center in Los Angles where he was the founding editor-in chief of the Simon Wiesenthal Annual, the first serial publication in the United States focusing on the scholarly study of the Holocaust. Dr. Grobman edited Genocide: Critical Issues of the Holocaust, a companion to the Centerâ€™s Academy Award winning film Genocide. Dr. Grobman is the author of Rekindling the Flame: American Jewish Chaplains and the Survivors of European Jewry, 1944-1948, and editor of In Defense of the Survivors: The Letters and Documents of Oscar A. Mintzer AJDC Legal Advisor, Germany, 1945-46. His book with Michael Shermer, Denying History: Who Says the Holocaust Never Happened, and Why Do They Say It? was published by University of California Press in Berkeley in 2000. In 2002, it was published in Italian and in paperback. He has also edited: Anne Frank in Historical Perspective, Those Who Dared: Rescuers and Rescued, and a guide to Schindlerâ€™s List. â€œHolocaust Denial: A Global Survey â€“ 2003â€� was written with Dr. Rafael Medoff in December 2003. In April 2004, he and Rabbi Jack Bemporad wrote an analysis of Mel Gibson's The Passion of Christ. He is now writing a book on how to respond to Arab propaganda. He trains Jewish students how to counter Arab lies on American college campuses. One of those students, Josh Suskewicz, started after graduating high school, and is now a junior at Harvard University where he is president of Harvard Students for Israel. Another is a senior at Yale University.